Brandon WilliamsCraig Sensei (and Free Aiki Dojo) have moved to Texas. Feel free to make contact, but classes including Martial Nonviolence in the SF Bay Area are now limited to 12-1 PM at Aikido of Berkeley on the first and third Saturdays, and are taught by Peace Practices instructor, Julian Wilner. Please consider joining Aikido of Berkeley; Kayla Feder Sensei is a world class martial artist. Please visit any of her classes and see for yourself. 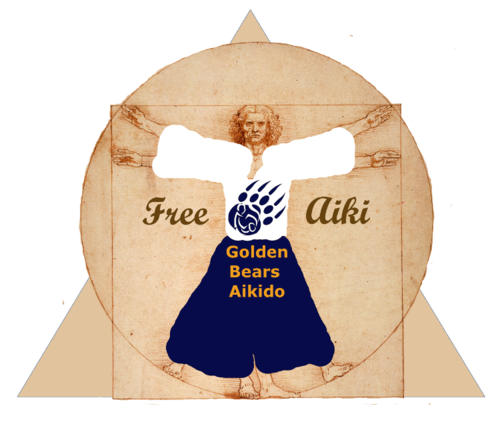 If you are interested in continuing Golden Bears Aikido on the Cal campus, feel free to make contact and discuss options, but classes are on hold until new leadership steps up. If you would like to create a Free Aiki Dojo yourself, please keep reading (< click if no text appears below). The intention is not to eradicate the traditional dojo environment. Rather it is to increase freedom in aiki practice, so the more traditional students are subject to the stress of training with a subset of less traditional students, and vice versa. The hope is that this will create conflict which must then be facilitated and studied in order to both welcome everyone and ground physical practice in the body and daily choices, so that the resulting new patterns may contribute to Aikido 2pt0 and be carried out of the dojo. Aiki principles applied in the real world. Learn peace-making you can apply in any situation. All practitioners of all martial arts, including all aikido styles, are welcome to come and learn how we combine traditional aikido and the process arts. Pacific Rim International School in San Mateo and Emeryville, a Whole Community initiative and partner in securing international funding.